The Hill Rom TotalCare Sport "Connect 2" hospital bed is designed to help prevent and treat patients with bed sores, skin ulcers, pressure wounds and pressure ulcers. This bed has lateral rotation which turns the patient and a low air loss mattress. SAN DIEGO - June 17, 2018 - PRLog -- Hospital beds made to treat bed sores and skin ulcers are designed to keep the patient mobile and also provide an air mattress system which provides a high level of pressure redistribution. The bed manufacturer Hill Rom makes a hospital bed made to help prevent and treat bed sores and the bed is called a "P1900 TotalCare Sport Bed" which includes a low air loss mattress and a bed frame that performs a "chair position". Pressure wounds, bed sores, pressure ulcers and other types of skin breakdown are normally symptoms developed by patients that spend large amounts of time in bed and are immobile or have some level immobility and have prolonged positions in bed without movement. The Hill Rom TotalCare Sport "Connect 2" bed model has a feature called "lateral rotation" which automatically turns the patient and also a "percussion - vibration" feature which helps break up upper respiratory congestion. The auto patient turning helps treat and prevent bed sores along with a "low air loss" feature that runs a layer of air conditioned air over the top of the mattress pad to help keep that patient cool and prevent sweating. These features greatly help prevent and treat bed sores and skin ulcers and that is what makes this the number one bed model customers choose to help friends and loved one with bed sores at "Hospital Direct Medical Equipment Inc. 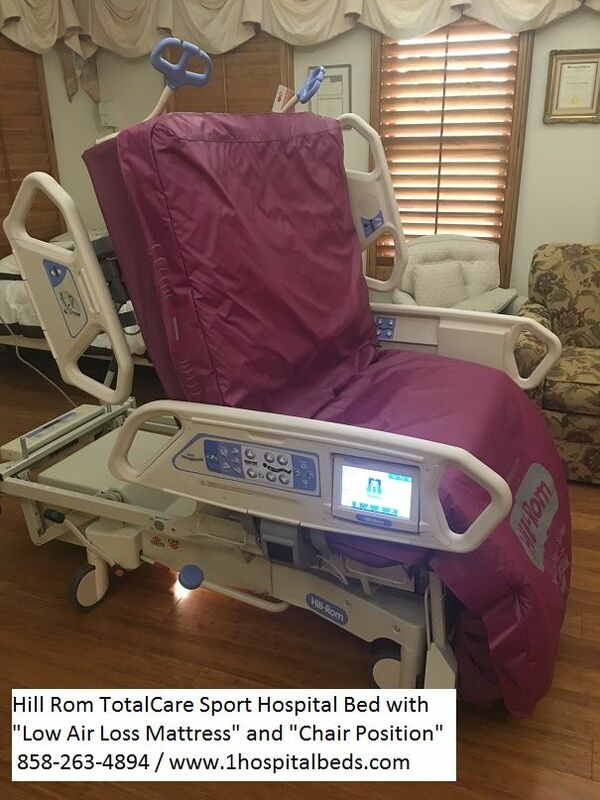 According to owner Sean Callahan the "Hill Rom P1900 TotalCare Sport Connect 2" bed is one of the top selling beds in intensive care and acute care sections of hospitals and is one of the top selling beds they sell used and refurbished to patients who need a high level of care in homes, nursing homes and long term care facilities. "By purchasing a hospital bed with the mattress connected to the bed frame the patient gets a wider range of motion because the bed and the mattress work as one unit and the mattress deflates in certain areas as the bed moves like a "chair position" offered in the TotalCare Sport bed. Many companies sell "replacement air mattresses" which lay over the top of the bed and since they are not connected the bed and mattress do not work together as one unit and it limits the mobility of the bed and bed positioning." The Hill Rom P1900 TotalCare Sport bed comes in a "Sport 1", "Sport 2" and "Connect 2" versions with the "Connect 2" being the latest version offered in the used - refurbished medical bed market. "It is our goal to offer the general public the highest level of bed available and the one which is the most reliable and the Hill Rom TotalCare Sport Connect 2 bed model is the most recent model we can offer." Callahan continued. As one of the leading Hill Rom bed refurbishment companies in the USA Hospital Direct Medical sells hospital beds by the thousands helping many patients and families with high state of the art medical beds for patient with bed sores or at risk of bed sores. The list of patients that purchase these beds include patients with ALS, MS, Alzheimer, quadriplegic and paraplegic patients and those with other serious conditions and injuries. For patients and families with loved ones dealing with bed sores, skin ulcers or patients in need in acute care beds with air mattress features contact Hospital Direct Medical for prices and more information at 858-263-4894 for California and 540-327-7376 for Virginia or visit the links below for videos and more hospital bed information and options. : Hospital Direct Medical Equipment Inc.